Health Medicine Network – Grapefruit can seriously affect your medicine. Have you ever seen the instruction on your medication ‘do not take this medicine with grapefruit juice’ and wondered why? You’re not alone. At least 53 medications can be made less effective by the citrus fruit and people taking certain drugs should take extra care when deciding whether to eat it. Grapefruit contains a compound which interferes with an enzyme in the small intestine, which is responsible for breaking down nearly half of all medicines. As a result, the fruit can make medicines too strong or not strong enough by affecting how well your body absorbs them. 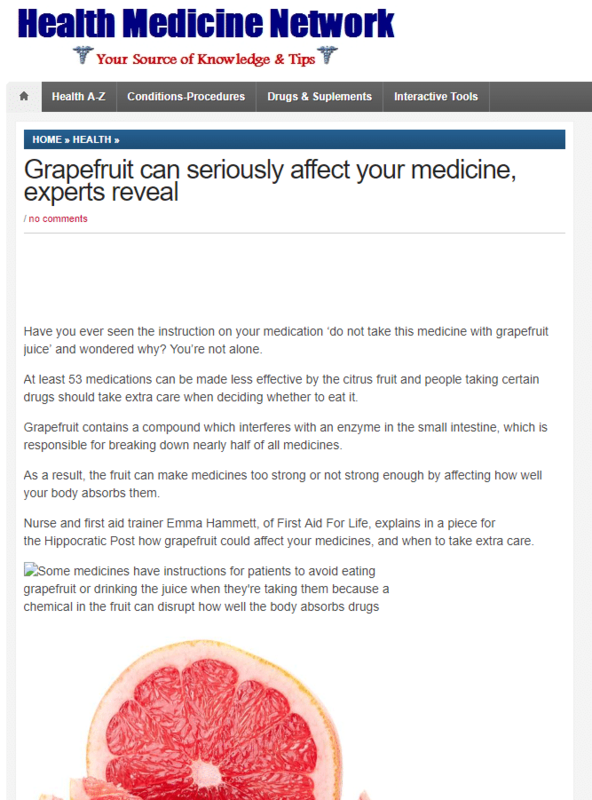 Nurse and first aid trainer Emma Hammett, of First Aid For Life, explains in a piece for the Hippocratic Post how grapefruit could affect your medicines, and when to take extra care. Grapefruit can seriously affect the way your medicines work, especially if you are taking some of these common medicines for high blood pressure, cardiac arrhythmia, a statin to reduce your cholesterol, or fexofenadine for allergies such as hay fever. The extent of the interaction can be different depending on the person, the drug, and the amount of grapefruit juice you drink or fruit you eat. Most commonly the presence of grapefruit juice leads to more of the medication being able to enter the blood stream. For example, if you drink a lot of grapefruit juice alongside certain statin drugs (used to lower cholesterol), too much of the drug can be released into your bloodstream and takes longer to metabolise, therefore remaining in your body for longer. The higher dose in your bloodstream increases the risk of liver and muscle damage and can lead to kidney failure. Grapefruit contains a compound called furanocoumarin which inhibits a vital enzyme in the small intestine responsible for breaking down nearly half of all medicines. 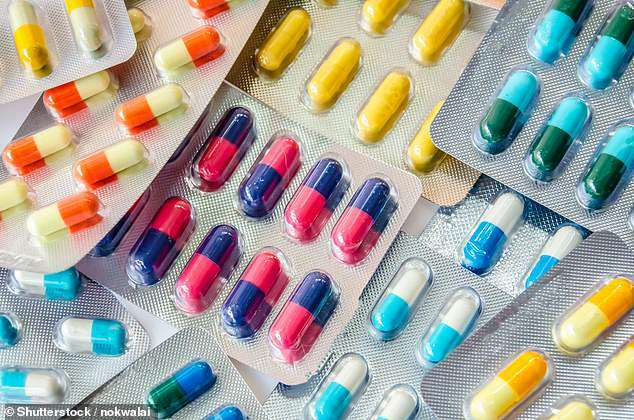 Many drugs are broken down with the help of a vital enzyme called CYP3A4 in the small intestine. The furanocoumarins within grapefruit frequently block the action of CYP3A4. Instead of being broken down, more of the drug enters the blood and stays in the body longer. The result: too much drug in your body for a longer period. The amount of the CYP3A4 enzyme in the intestine varies from person to person. Some people have a lot of enzymes and others just a little. Therefore, grapefruit juice may affect people differently even when taking the same medication. It doesn’t take much grapefruit juice to boost the levels of drugs that are susceptible. Just a single glass of juice can reduce the production of the intestinal enzyme that regulates absorption by up to 47 per cent. The furanocoumarins take a while to be removed from your system and so a third of their impact is still evident after 24 hours. It will therefore have a continuing effect on the potency of your medication. Seville oranges (often used to make orange marmalade), pomelos, and tangelos (a cross between tangerines and grapefruit) often have the same effect as grapefruit juice. Avoid these fruits if your medicine interacts with grapefruit juice. Furanocoumarins are not present in varieties of sweet orange, such as naval or Valencia oranges and so these could be an alternative option for you. Grapefruit can work both ways. Sometimes it blocks the metabolism and allows too much of the drug to enter the bloodstream. Sometimes it has the opposite effect and with some medication it reduces the amount of drug in the blood stream. For example, with Fexofenadine (commonly taken for allergies), grapefruit juice can cause less fexofenadine to enter the blood, decreasing the potency of the medication and how well it works. This opposite effect is caused by grapefruit juice affecting specific proteins in the body known as drug transporters. These proteins help move drugs into our cells for absorption. If the drug transporters are affected by the fruit juice, then less of the drug will enter the blood and the drug is not likely to be as effective. When drugs are swallowed, they are usually metabolised by enzymes and/or absorbed using transporters in cells found in the small intestine. Grapefruit juice can cause problems with these enzymes and transporters, causing too much or too little drug in the body. Some drugs are broken down by a specific enzyme CYP3A4. Grapefruit juice can block the action of this enzyme. This leads to an increase in the amount of drug in the body and can cause more side effects. 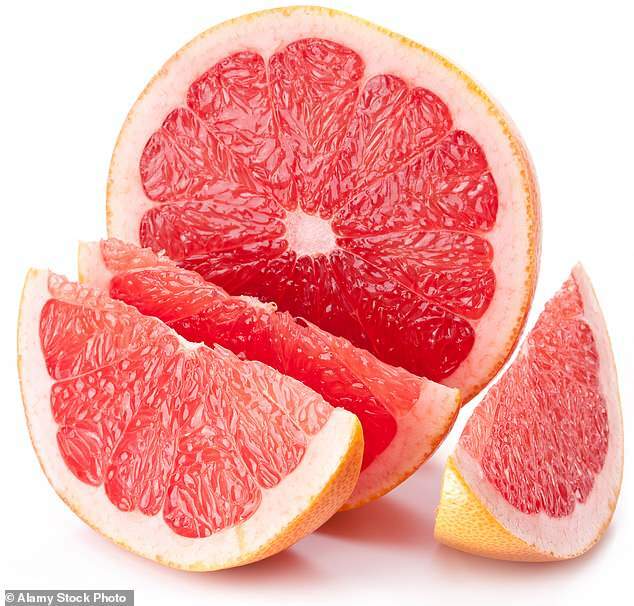 Grapefruit juice blocks the action of these transporters, decreasing the amount of drug in the bloodstream. This means the drug does not work as well. Despite this, some people may not experience any problems with it at all. Grapefruit is a healthy option, packed full of Vitamin C so, before banishing your beloved grapefruit from the breakfast table, find out if there are any reasons not to grapefruit juice while taking your medication. Your doctor, pharmacist or healthcare provider should be able to advise how much, if any, grapefruit juice or fruit is advised, which other fruits or juices may also affect your drug in a similar way to grapefruit juice. Or read the patient information leaflet that comes with your prescription drug to find out if grapefruit juice affects your drug. 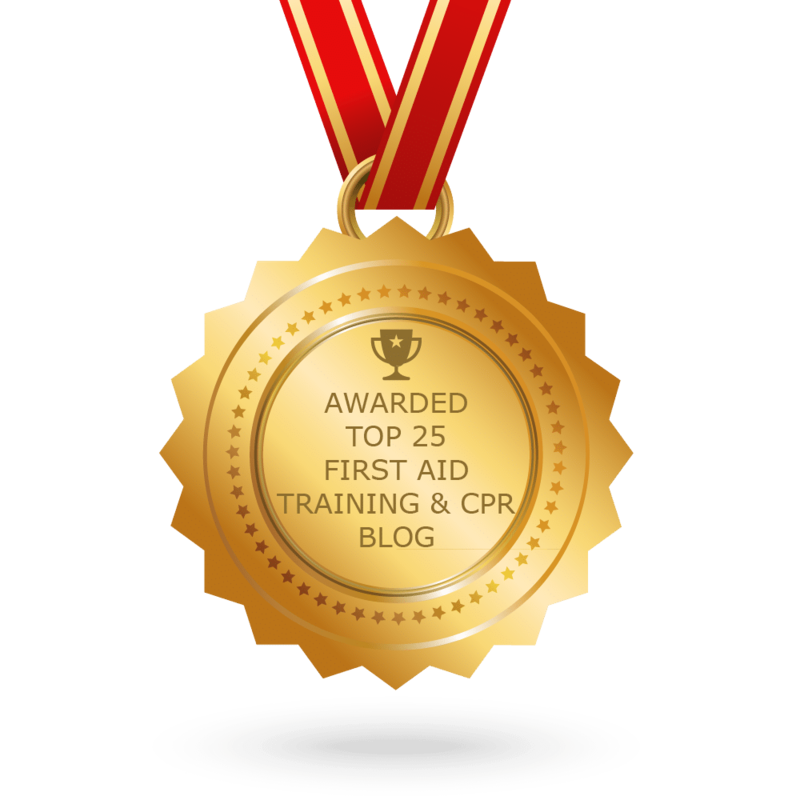 This article originally appeared on the Hippocratic Post and has been reproduced with their permission.